Pablo Escobar is most effective as a character in isolation. That’s true for a lot of Narcos, really, as the show has never truly made a case for any of its characters being complex enough to carry an entire series. Narcos is about plot first, but the pursuit of Pablo Escobar has provided some very good actors some impressive, if isolated, moments. But the bulk of “Nuestra Finca” is centered on Pablo, and, like the best of Narcos, the scenes on the isolated farm are stunning—in isolation. Certainly, there’s a thudding symbolism when Pablo sends Limón to dig up a stash of money nearby, only to find the half-million dollars soaked through and useless. “It’s rotten, sir,” reports the sad Limón. Rotten also is the meager $6,000 Limón presents to Pablo, coming as it does from Maritza, left lying dead by her infant daughter. As much as Martina García and Gomez have brought to their characters this season, their roles—as symbolic victims of what Pablo Escobar has made of Colombia—finally doomed them here to play out a tragic fate that’s as sad as it is pre-ordained and abrupt. Still, Maritza’s fiery defiance in the face of her former friend’s threats, and Limón’s wrenching decision to throw in with Pablo irrevocably—even if he’s let off the hook with a convenient arm-jostle—is a final gut-punch for two characters I thought might still stand a chance in the end. 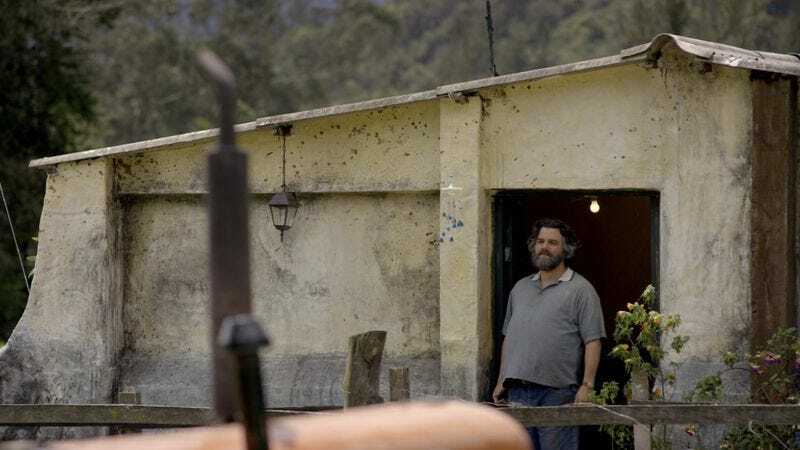 But “Nuestra Finca” is notable as the most extended examination of Pablo’s inner workings we’ve ever gotten, and Wagner Moura makes the most of it. As unnecessarily drawn-out as this season’s narrative has felt at times, this extended detour provides some welcome room for Moura to show what makes Pablo tick. Narcos never got a handle on how its antagonist/antihero was to be perceived, the two sides of Pablo Escobar less intertwined than presented in alternating scenes. But here, as Pablo and Limón join in with Pablo’s taciturn father in mending fences and milking cows, the interlude is rich ground for Moura to stake out just who Pablo is. Moura’s ever been Narcos’ most riveting presence, whether roaring in bloody rage or expressing gentleness and loyalty to those he loves. Here, we see the latter first, as Pablo almost wordlessly slips back into his father’s life and routine, clearly taking pride in performing manual labor and even out-rising his father in the morning. (“There’s coffee in the thermos,” he offhandedly tells his father as Pablo, already hard at work in the early morning, pounds another fencepost into the earth.) The episode eschews Narcos’ signature over-elaboration for the most part, the buried past between father and son playing out in unspoken glances and Moura’s amused little smiles when he imagines his father approving of his efforts. Pablo’s past and his present situation intrude, naturally. Pablo’s indulgent smile at seeing his father guffawing at his favorite sitcom gives way to a commercial offering a reward for Pablo’s arrest. And the father dodges the question when Pablo, seemingly idly, inquires about buying a neighboring farm, bringing Tata and the children, and working the land together. I don’t buy that—as it turns out—Pablo is at least seriously considering such a possibility. After all, his father told him the police have come to question him as recently as a few months ago. But, just as the ruddy, bearded Pablo’s country sojourn has become its most benignly pleasant—Pablo smoking a joint in a field of wildflowers—this silent rebuke to his vision of the future sees Pablo Escobar the implacable tyrant return. You can see it in Moura’s face and body language, snagging like a thorn. Pablo, his seemingly desperate situation notwithstanding, imagines that his will could, once again, remake the world as he wishes it to be. This time as a country farmer, going backward in time to become the person he might have been. There’s a bluntness to the flashback that accompanies the moment here, Hermilda regaling the adult Pablo with the tale of how, as a young boy, he stood strong when soldiers attacked their village. There’s no talk of Pablo’s father, Hermilda telling her son, “Already you were the man of the house…. I knew that day you were destined for great things, Pablo.” The contrast is too plain, with the social-climbing, driving Hermilda—stealing shoes so young Pablo won’t look poor—set against the hard-working, humble, honest father, who, in a stunning scene punctuated by blood, renounces his son completely. Unable to let the perceived slight from his father go, Pablo approaches while the man prepares to butcher a hanging pig, asking why his father wouldn’t join in with his vision of a peaceful retirement in the country. The father demurs, then maneuvers it so the kneeling Pablo is splattered with a gout of pig’s blood. The ensuing face-off, with the furious Pablo contemptuously flicking away the blood caked in his beard, is as raw and gripping as Narcos has ever been, Pablo’s father refusing to back down in the face of his son’s terrifying, clench-jawed anger. (“Funny that you don’t like blood,” the father sneers, “How strange.”) As ever, Pablo cannot stand to be shown disrespect, and Moura makes Pablo’s furious posture horribly menacing, challenging the old man, “Tell me what you think of me.” When his father responds that he’s ashamed that his son is a murderer, Pablo snaps back, “At last. The truth,” as if in triumph. Both actors are outstanding, and Narcos lets the characters’ lifetime of conflict express itself in satisfying ambiguity. When Pablo leaves the farm in the night with Limón, he leaves behind his final stack of cash. As a gesture of penance? To shame his father into accepting his son’s blood money? The scene ends with us not knowing, and Narcos is better for it. The pre-credits scene—where we don’t find out Castro’s character is Pablo’s father until Pablo says, “Good night, Dad”—is the sort of subtle, patient storytelling Narcos could use more of. That looks like a series wrap on Cristina Umaña’s always entertaining Judy Moncada. I especially liked the way she kept licking the cocaine off her fingers while discussing betrayal with Berna here. The Castaños’ car bomb attempt on Judy’s life is exceptionally well staged, with the explosion deployed a beat sooner than expected and the rest of the scene played out through the muted sound of Judy’s ringing eardrums. Pablo finally gets through to Tata when he comes home to Medellín, setting us up for the final Narcos (and Narcos review) of season two on Tuesday. See you then.